BINGHAMTON — 50 points in a game is an average night at the office for Glens Falls senior Joe Girard III. I’m serious. Prior to tonight’s game, Joe Girard III averaged 49.7 points per game this season. With a sold out crowd of over 9,000, The Syracuse commit did what he does best. He put on a show, but not just any show. Glens Falls beat Lowville 75-74 to win its first ever New York State Public High School Athletic Association title. This one was a legendary thriller with a Walt Disney ending. The bucket that got him to 50 points in the New York Public High School Athletic Association Class B final will be one he’ll never forget. Lowville sophomore Aidan MacAuley made 1-of-2 of his free throws and the Red Raiders led 63-60 with 35 seconds left. Girard III and David Barclay each missed a shot on the following possession, but Connor Girard threw the ball off the foot of Lowville’s Aidan Zehr with 20 seconds left. After a Glens Falls timeout, Joe Girard III came off a staggered screen at the free throw line and hit a game-tying three-pointer with 18 seconds left. Lowville failed to get a shot off in its final possession and the game headed to overtime. Lowville led 74-70 with 15 seconds left in OT, before fouling Girard III. He made both free throws. Glens Falls intentionally fouled Hudson White, who missed both free throws. The following possession, Girard III gets fouled on a drive. He makes the first, and misses the second on a lane violation. Lowville calls a timeout and attempts to run a full-court play, but before the ball is inbounded; an illegal screen is called. Glens Falls had previously substituted Girard III out of the game to prevent him from picking up his fifth foul. They were unable to substitute him back in because no time had elapsed on the change of possession. They inbounded the ball, but it deflected off of Lowville, taking two seconds off the clock. In comes the superhero — Joe Girard III. Down 74-73 with three seconds left, Glens Falls set a staggered screen to the right of the free throw line. Girard III fought off two defenders, cut baseline and sank a layup off the right side of the glass as the buzzer sounded. Shot 27/64 from the field (42.2%), 12/16 on free throws; 41 rebounds; 13 assists; 12 turnovers. Joe Girard III 50 points (16/40 from the field, 10/16 from 2, 6/24 from 3), 12/14 from the free throw line, 9 rebounds, 2 assists; Connor Girard 10 points, 5 assists. Shot 27/55 from the field (49.1%), 11/18 on free throws; 30 rebounds; 14 assists; 11 turnovers. Girard III now has 4,678 career points in five varsity seasons. He will have at least one more game to increase his career point total. 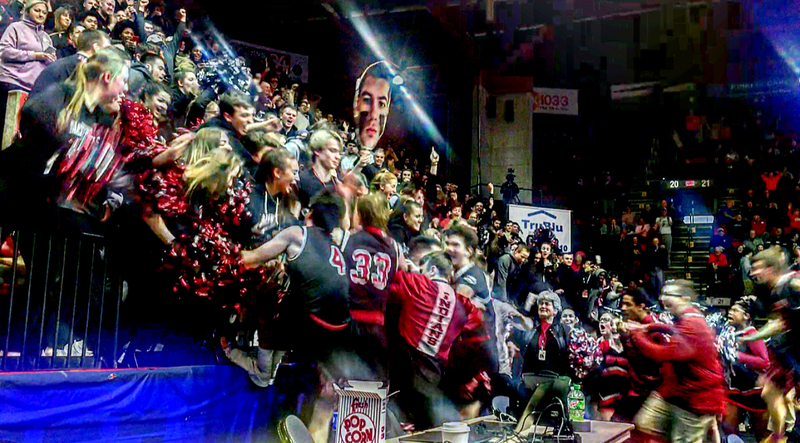 Next Friday at a time TBD, Glens Falls will play in the semifinals of the 2019 Class B Federation Basketball Tournament of Champions at the Cool Insuring Arena against South Bronx Prep (27-3).